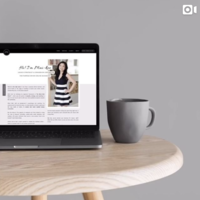 With the rise of the “drag and drop” web builders out there, it’s become a hell of a lot easier to create a website for your business – a.k.a your online home! It’s your place to showcase you and everything your business stands for. So, while you can probably get by without one in the starting phases of your business, the barrier to entry to creating your website is as low as it’s ever been. But – and this is a big but – because it’s easier than ever to DIY your website design these days, there are a LOT of mistakes being made which can be fatal to your business’s success. Mostly because they only “look” the part, when they also need to bring home the goodz. That’s why I’m going to be sharing 5 with you today – the what, why, and how to fix them with some extra pro tips! Up 70% of your website traffic happens on mobile. How does this relate? Well statistically, knowing that nearly ¾ of your website traffic is on mobile – you’ve got to make it just as stellar as your desktop version (if not even better). Plus, it makes our buddy Google happy too, since the algorithms strongly favour mobile-friendly sites. If you don’t? That 70% of your traffic gets lost into the ether of the internet… and that’s not okay. You deserve better stats than this! First off, you can use Google’s Mobile Friendly tool to find out your site is actually mobile friendly or not. But, being mobile friendly ≠ USER friendly. Meaning your site also needs to be straightforward, easy to read, and to navigate. PRO TIP: Before launching your site, ask a couple of people to test it on desktop and mobile. Sit next to them and observe how they navigate through your site. What are the first buttons they click? Is there something they tried clicking twice or were confused about what to do next? Ask them to fill in your contact forms, and get some feedback on how user-friendly the process was. No one wants to read a WALL of text. In fact, about 79% of your visitors won’t read your web copy (Nielsen Norman Group). They will scan the page, look for the info they’re interested in, and will move on. To be honest, most website visitors aren’t even “readers” anymore – they’re “scanners”. No more fluffy, jargon-filled walls of text. Make it easy for your “readers” to scan by writing in short paragraphs (2-3 sentences max), and formatting your text with the use of headings, subheadings, and bullet points. 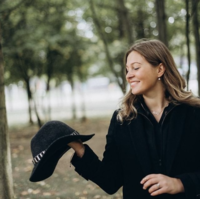 Remember that you’re writing for your ideal client and not for you (I know, #truthbomb) – so the first step is being crystal clear of who your Ideal Client is so you can target your content specifically to them. (I have another blog post dedicated to this topic which I’ll link at the end for you – so make sure to check it out too to get clarity on who your Ideal Client is). Remember that there’s more likely to be a knowledge gap between you and your prospects, so make sure to speak in their language. You’re the expert in your field, but they may not know all the ins-and-outs about what you offer. So keep it simple, straight to the point, and remember that you can always show off your expertise during your first meeting/consultation call! Be honest, how many times have you closed a browser tab because a website took too long to load? (Me too. Wayyyy too many times). There is a lot of research out there, but the TLDR answer (“Too Long Didn’t Read”) is that you should aim for anything between 2-3 seconds if you want to keep your viewers happy. Yes, 3 seconds! Considering that you only have about 7 seconds to make a good impression online… every second counts – and you don’t want to waste of that precious time by having a slow site. One of the best (and easiest) places to start is by optimising your images. Before uploading your images to the website, make sure you compress them in Photoshop. Or, if you do not have access to a design program, you can use an online tool such as compresspng or compress.io. If you’re using WordPress, then you can download the “Smush” plugin, which automatically optimises your images for you (#Win)! Most people are unaware of the impact that large images can have on their sites. But it’s important to know that small-size images ≠ low-quality images. 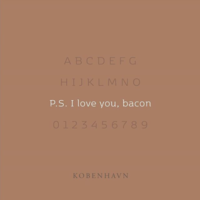 The golden rule is to decrease the physical size of the image as much as possible without losing its visual quality. PRO TIP: You can use another Google Tool – Think With Google – to check your site’s loading speed and find out what may be slowing down your website. The last thing you want to do is reel your website visitors in… only to have no place to send them. Can you recall a time when you wound up with a ‘404’ error page? It’s frustrating and somewhat disappointing, right? That’s all it can take for them to leave your site for eternity! Make sure you regularly check your site for broken links by using a tool called Dead Link Checker. Use this especially if you have a portfolio or a blog that constantly updates and links back to! PRO TIP: Since we touched on the ‘404’ error page, don’t forget to design it too! A lot of DIY designers forget about this page – but it could be an amazing opportunity to turn a dead link error page into a conversion machine! Chances are since you’re reading this, you may already know that a brand is more than just a logo. (If not, then at least you know now!) It’s a combination of qualitative and visual aspects that are unique to you and your business. Your visual elements such as you: fonts, colours and additional graphics. Consistency is what truly creates a brand. And if you want your site to look the part and position you as the reputable expert/business that you are, it needs to be aligned with your brand. That way, your website will come from a place of intention, speak directly to your ideal client, and build trust with your visitors. If you’re just starting out and DIY’ing your brand, make sure you have some clear visual guidelines to begin with. A good starting point would be to have: a set of logos, a colour palette, and font hierarchy that you can use on your website and other brand touchpoints. Eventually, you would want to create a cohesive brand experience and work with a Brand Expert, who will be able to guide you through a Brand Development Process to build a purposeful, intentional brand from within. 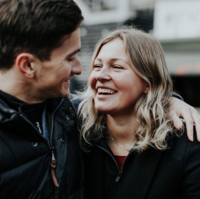 That way, you will be able to create a memorable, cohesive brand experience that sets you apart and connects with your visitors on a deeper level. Anddd there we have it my friend! 5 common (and fatal) mistakes to avoid when DIY’ing your website design! (I’ve got 10 more up my sleeve actually, so if you would like me to turn this into a 3 part blog series, let me know your thoughts in the comments below)! If you’re interested in elevating your brand further by taking it through my signature Development Process, click here to fill in my Brand Questionnaire and see if we’re a good fit to work together! Found this blog helpful? If you did (and I sincerely hope you have), I would love and appreciate it if you shared this with your friends and fellow entrepreneurs who would value this too! And if you have any further questions, suggestions, or would just like to say hey – I’d love to hear from you over on Instagram @One6Creative! That’s where I hang out the most! My blog post on How to Define your Ideal Client Avatar + it comes with a really useful freebie! Wanna jump ahead of the competition right now? 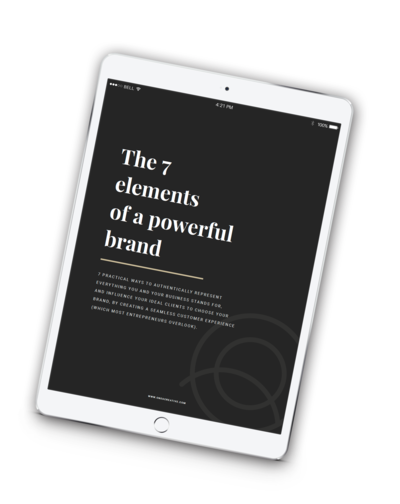 You can get a head start and begin your brand transformation with our FREE guide on the 7 Elements of a Powerful Brand!